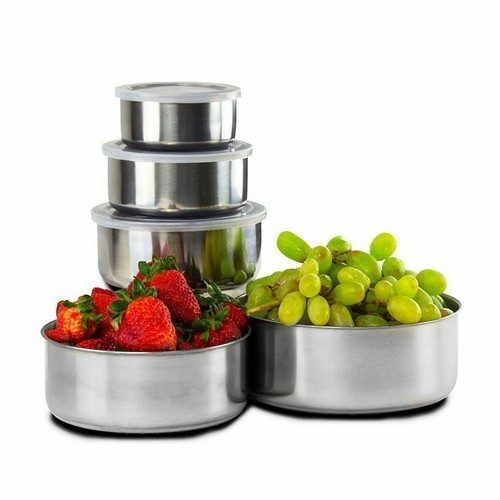 5 Piece Set: Home Solutions Stainless Steel Storage Bowl Set with Plastic Lids Just $7.64 Down From $39.99 At GearXS! Ships FREE! You are here: Home / Great Deals / 5 Piece Set: Home Solutions Stainless Steel Storage Bowl Set with Plastic Lids Just $7.64 Down From $39.99 At GearXS! Ships FREE! GearXS has this 5 Piece Set: Home Solutions Stainless Steel Storage Bowl Set with Plastic Lids on sale for $7.64 (Reg. $39.99) when you use promo code GXS-PRES + FREE shipping! Serve meals in these handy bowls, then add the plastic lids to easily store the leftovers. This Home Solutions 5PC Stainless Steel Bowl Set with Plastic Lids can be nested together for convenient storage. Great for packing lunches or taking snacks on the go!